The biggest earthquake to hit the Highlands in three decades has been widely felt across the region. The British Geological Survey (BGS), which recorded it at about 15:45, said it had a magnitude of 3.8 and was centred on Moidart. A smaller quake, which registered 1.5 on the Richter scale, was centred on Kingussie. It was the biggest such tremor to be felt in the region since a 4.1 magnitude earthquake in Oban in 1986. More recently there was a magnitude 3.5 earthquake in Glenuig in January 2011 and one measuring 3.6 in Dumfries, on Boxing Day 2006. On the latest event, the BGS stated: "This earthquake was felt widely across the west of Scotland." People in the area shared their experience of the rumble on Twitter. One wrote: "Think I just experienced a minor #earthquake, here on Ardnamurchan. 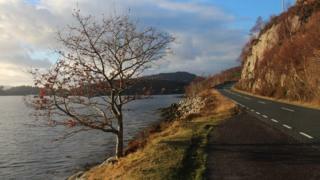 West coast #Scotland. Anyone else feel it, my kitchen rumbled." Another said: "Just experienced 2 earthquake tremors here in Scotland. Never felt anything like that, like the ground beneath us was exploding. Terrifying!" Small earthquakes are relatively common but most go unnoticed. The largest one known to have hit the UK had a magnitude of 6.1 on 7 June 1931 in the North Sea while the biggest recorded in Scotland was a magnitude 5.2 event in Argyll in 1880. A mapping project recently said there had been more than 4,000 quakes to hit Scotland over the past 50 years.